Over the past years, the Labnaha exploration team has explored more than 80 cenotes north of Playa del Carmen in the state of Quintana Roo, Mexico. In this area, a great number of cenotes are still waiting to be discovered and explored. 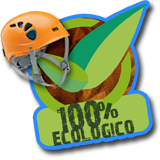 There is a great morphologic difference between the cenotes surrounding Playa del Carmen. Although they are all close together, under water they look very different from each other. The most significant contrast between the systems is in length and depth. The majority of systems located north of Playa del Carmen have many collapses or breakdowns. As a result, some are impossible to pass and most are not longer than 300 meters (1000 feet). However, there are some exceptions such as the systems Burrodromo (6 kilometers, 20,000 feet), Crustaceo, and Bacteria. The average depth of the northern systems ranges from 18 - 24 meters (60 - 80 feet) with a maximum of 48 meters (160 feet). Systems in the south tend to be much longer and the average depth ranges from 8-18 meters (27 - 60 feet). Geologically, the northern and southern systems are similar as they are both composed of limestone. They also share the same altitude and rainfall average per year. Despite these similarities, the vegetation found in the south varies significantly from that of the north. To the south of Playa del Carmen, where the larger submerged cave systems are located, one can tell just by looking at the trees that they are much older and bigger than the ones in the north. But why? One possible explanation is a big fire which occurred after Hurricane Gilberto (in September 1988) resulting in the destruction of 57,000 hectares of jungle on the Yucatan Peninsula. The interesting part is that in the area affected by the fire, the underground tunnels have many breakdowns and are either partially or completely collapsed. Where the fire didn’t destroy the jungle, there are less breakdowns. Limestone is a very porous rock, much like a sponge. When exposed to high temperatures such as those produced in a fire, limestone tends to explode due to trapped air expanding inside it. During the 1988 fire, unprecedented temperatures were reached. Could it have caused those collapses? As I entered to explore this new cave, this is what I thought likely since the majority of systems to the north almost always end in a series of breakdowns and collapses. But remember I am only a cave instructor and not a specialist in hydrogeology. This cenote is located only 200 meters (660 feet) from my house, but I had never seen it before. Why? It’s very easy to explain. The jungle here is very dense and one could easily pass close by a cenote without ever seeing it. In fact, the landowner himself was not aware that there was one on his property. One of his workers discovered it while clearing the land in preparation for construction. 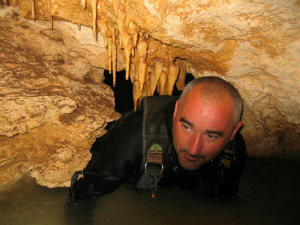 Subsequently, the owner contacted me in order to explore this newly discovered cenote. As we began our exploration, we found the water to be very transparent, but there was a large quantity of clay on the ground. In no time, the clay transformed the crystal clear water into zero visibility. Diving the upstream side, we reached a maximum depth of only 4 meters (14 feet). After passing a major restriction, the tunnel widened to about 10 meters (30 feet) heading north. After some minutes, we reached an air pocket where we unfortunately encountered an intense smell of gasoline. Just past the air pocket, another collapse completely blocked the tunnel forcing us to turn around. After the upstream dive, we still had enough air to take a look at the downstream section. First, we entered a small dry cave leading us to the partially submerged part of the cave. We tied a guideline off as though it were a completely submerged cave in order to reach the entrance of the fully submerged cave without getting lost. Since we had walked through a large quantity of clay, the visibility quickly dropped down to zero. We could hear the noise of cars above our heads since we were right underneath the federal highway running from Cancun to Tulum. Upon reaching the completely submerged cave section, we connected an exploration reel in crystal clear water. Then we started to dive in a highly decorated cave with a maximum depth of 4 meters (14 feet). The passage way was quite different than the upstream part where we had been able to explore only 300 meters (1000 feet) of cave. Upon reaching the surface, my partner, Pep Llinares, and I asked ourselves why there would be such a strong gasoline smell inside of the air pocket. Even the water tasted funny in the tunnel leading north. The exploration was definitely a new experience for us since we usually explore in the middle of dense jungle where we don’t encounter foul smells and tastes or hear the noise of vehicles passing over our heads. Later on, at home, I made a map of the surveyed data and connected the entrance point with the air dome where we had smelled gasoline in order to get the exact azimuth and distance of the air pocket. 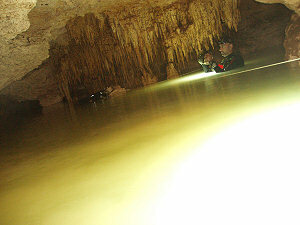 The next day, we went back to the cenote to conduct a land search for the area directly above the air pocket. There we found a mechanic’s shop where they repair bulldozers and other big machinery. 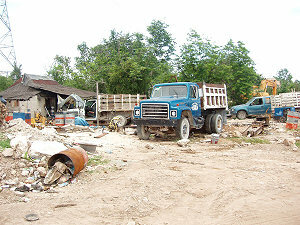 Many old broken-down trucks, bulldozers, caterpillars, etc. were just sitting there as corrosion destroyed them completely. 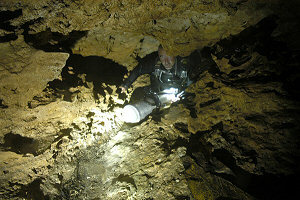 As a result, gasoline and oil were filtering straight into the cave below. With respect to the big fire theory, this cave, as well as Burrodromo, Crustaceo and Bacteria, was and still is surrounded by mangroves. Consequently, the fire never got close enough to produce temperatures hot enough to collapse the cave tunnels. Today, we keep exploring more and more tunnels in the cenote. It looks like this system is going to be the biggest on the north side of Playa del Carmen. The dry cave is certainly one of the nicest to be found in the Riviera Maya. Up this point, we have explored about 1400 meters (4620 feet). For all dives, we used side-mounted equipment since it is simply impossible to dive a cave like this one with back-mounting.